We were wearing shorts when we first read “Where Jesus Slept.” It was our first step into the holidays that are sneaking up on us. The weather as cooled here in Kentucky, and while it doesn’t still feel like Christmas is barely more than a month away, this children’s book ushered in some anticipation for the season we’re getting ready to celebrate and reminded us about Who makes this holiday – and all things – possible. I gathered my three kids in the rocker in the youngest’s room after dinner one night and we read. My first-grade son read some. My fourth-grade daughter read some more. And then I filled, reading some pages and keeping my 1-year-old girl from ripping the beautiful pages. Even in the chaos that is three kids piled in a rocker at the end of a busy day, I’m grateful we slowed down enough to read this book. I’m already looking forward to reading it more as Christmas approaches. “This is the bed where Jesus slept. This is the straw that lined the bed where Jesus slept.” From here, the story builds with each spread, adding a new element and explaining the relationships among the participants and witnesses to the first Christmas. Rachel, age 1: She kept pointing to the cow and wanting to turn the pages. From Jesus sleeping sweetly to the wise men bringing gifts, “Where Jesus Slept” reminds readers of all ages about the joyous event we celebrate at Christmastime. Children will love the delightful illustrations and the engaging repetition in this cumulative tale. This 32-page jacketed hardcover book retails for $16.99. It is aimed at ages 4-7. 3 to 20. 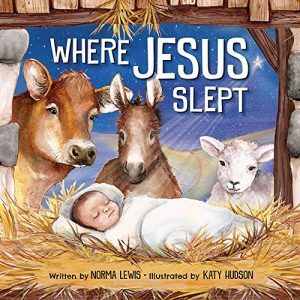 “Where Jesus Slept” is illustrated by Katy Hudson. I know not everyone is ready for Christmas, but this book will be a sweet addition to your holiday collection. I have a copy to giveaway to one of you, so be sure to use the Rafflecopter widget below to enter to win. The giveaway is open to U.S. and Canadian residents through Friday, Nov. 18. Fly By Promotions/Propeller Consulting provided my family a copy of this book and the one I’m giving away in exchange for a review and blog post. But these opinions are mine – and my kids’! If you have won a prize from FlyBy/Propeller in the last 30 days or have won this same book from another blog, you are not eligible to win. Winner is subject to eligibility verification. Every year we have a tradition of reading books around the Christmas tree with our grandchildren. This book would be a great addition to our collection. We love emphasizing the true meaning of Christmas — that God loves us so much He sent His son to earth as a baby. What a great tradition! And this would be a good addition! 🙂 Glad you entered to win! I am looking forward to so much…Kyle and I volunteer at our huge church event that helps people in the community and next year Penny will volunteer with us! 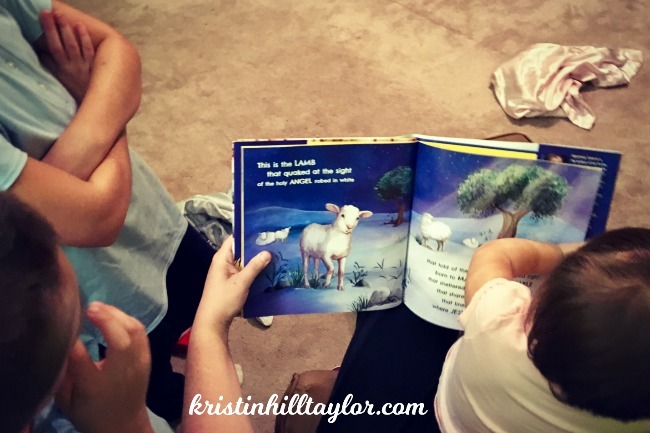 I love incorporating service into our traditions and I really love having the kids involved! We do Neighborhood Nativity each year. Look forward to reading this one with my kids and neighbors perhaps! Well, a neighborhood nativity sounds like a great tradition! Thanks for entering. I can’t believe it’s nearly Christmas time. This year has FLOWN BY!